Amble Lifeboat Fundraisers celebrate the RNLI Shannon Appeal being selected as the Jam Jar Army campaign back in March 2015. The search starts here for a 2016 beneficiary of our well-established Jam Jar Army campaign – the sixth since its launch five years ago. From today, the Gazette is looking for nominations from across north Northumberland for a local good cause to be the next beneficiary of the community’s fund-raising efforts. The Jam Jar Army appeal was first launched in May 2011 after author Judith O’Reilly came to us with the idea, and the target of raising £10,000 for HospiceCare North Northumberland was set. By the end of the year, the appeal, which at its simplest sees homes, shops and other businesses collecting small change in jam jars, had raised more than £13,000. It was followed, via a reader vote, by Alnwick Playhouse Youth Theatre in 2012, dog charity SHAK in 2013 and The Stephen Carey Fund in 2014, taking the overall total raised to more than £50,000. 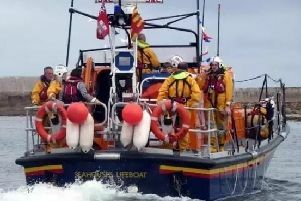 Last year, it was the turn of the Amble Shannon Appeal, which is aiming to raise £200,000 to bring a state-of-the-art Shannon-class lifeboat to the harbour town. Its reign as Jam Jar Army charity continues until the end of February, but in the last year, £80,000 has been raised for the appeal as a whole, including £3,000 in jam jars. Now it’s the chance for groups in the area to put themselves forward for 2016. Anyone wanting to nominate a beneficiary should describe, in no more than 200 words, what the charity is about and for what the £10,000 target amount would be used. Email ben.oconnell@jpress.co.uk or apply by post to Jam Jar Army 2016, Northumberland Gazette, Bondgate Without, Alnwick, Northumberland, NE66 1PN. The closing date for nominations is 5pm on Monday, February 8, and the shortlist will be published in the Gazette on Thursday, February 11, when voting will start. There will be another chance to get a voting form on Thursday, February 18, before the closing date for votes at 5pm on Tuesday, February 23. The winner will be announced on Thursday, February 25.